Peer review has been a traditional activity in the writing classroom as a way to encourage students to not only produce writing but also learning how to evaluate them. There are studies that confirm the reliability of student reviews, giving confidence to their use as complementary to instructor’s evaluation. However, for many years, peer reviews have relied on conventional means of reading and writing, i.e., papers and pens, to accomplish the task. It wasn’t until more recently that instructors from the field of computers and composition have taken interests in digitalizing the peer review process using newer technologies such as mobile computers and online learning management systems. With more innovative technologies being produced and popularized today, I see greater opportunities for instructors today to think outside the conventional approaches to engage students in the writing process. 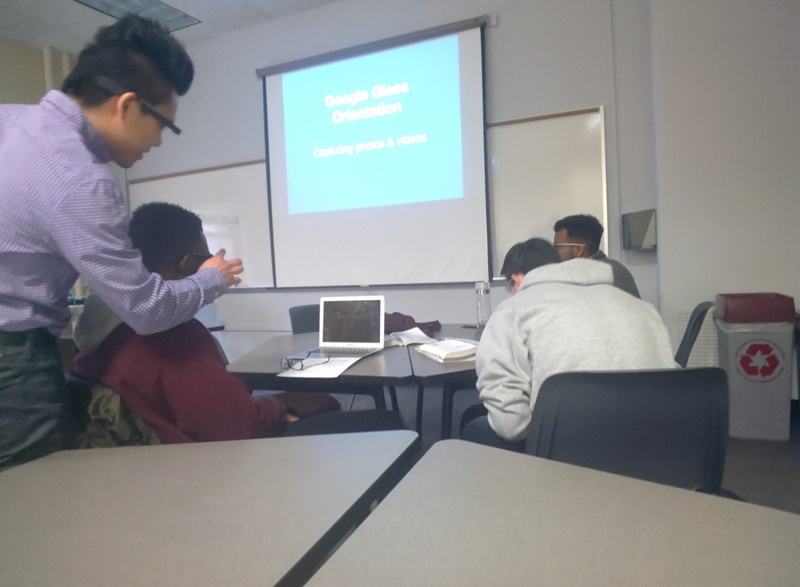 Google Glass affords a new dimension to our writing experience by augmenting the writing and revision processes. While a traditional peer review requires students to review the writings of other student writers’ and respond to prompts given by the instructors, such practice is driven mainly by the written texts. 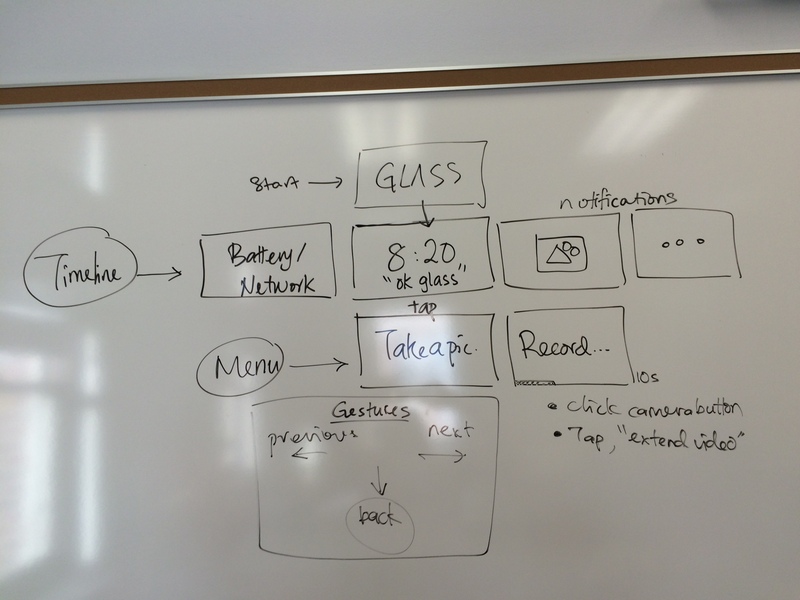 Using Glass, students could track comments and editing suggestions through video recording. Reviewers may indicate places in the writing where revisions are recommended by snapping a picture or recording the suggestions in video. These images and videos could be sent to the respective writers after the review session. Such affordance adds value to the review process, one that enriches writer-reviewer exchange and collaboration. Rough sketch: My quick and dirty mapping of Glass’s interface. Put on Glass and start recording a video. See tutorials attached for ways to extend a video recording. Make sure the lens reflects a recording that’s close to the reading level. Then, continue by “thinking aloud” as you review the paper. You don’t have to talk all the way through the paper, but remember to verbalize your thoughts on different parts of the paper as guided by the peer review prompts provided by the instructor. Fill out the reviewer sheet as you go. Don’t keep it until you have finished recording to fill them out. Stop the recording. Be careful not to delete the recorded video by accident. Turn Glass off and return it to your instructor. Your instructor will let you know when you should return the reviewer sheets to their respective student authors. Don’t return them until you are told to do so, as other students might still be recording their reviews. On Feb. 12, we conducted our first Glass-mediated peer review. Overall, students did very well on their first try and the footages turned out great. I have compiled a short video clip below to show the review process in action. Recently, Steve Kolowich of The Chronicle of Higher Education explored the uses of videos in the writing classroom by asking this question: Could video feedback replace the red pen? In his report, the Australian instructors find that video feedback to student writings offer a similar intimacy as in-person feedback “in a less-ephemeral way.” By incorporating Glass into the peer review process, my hope is to investigate the usefulness of video feedback as advocated. The results from my first Glass deployment on Feb. 12 seem encouraging. Although there were some hiccups in the facilitation of using it in peer review — as expected — the overall outcome indicates a positive response from the students. More importantly, in addition to satisfaction, Glass seems to be capable of reconfiguring the writing process by giving it an extra dimension that is an asynchronous presence of the reviewer in the revision process. This adds value to the critiques produced for the writer as they are no longer just fleshless comments but embodied feedback that takes verbal, nonverbal, and para-verbal/gestural communication into considerations. In other words, the comments can now be read in context. In the coming weeks I will continue to deploy Google Glass during peer review sessions and I will reflect on the experiences as they occur. 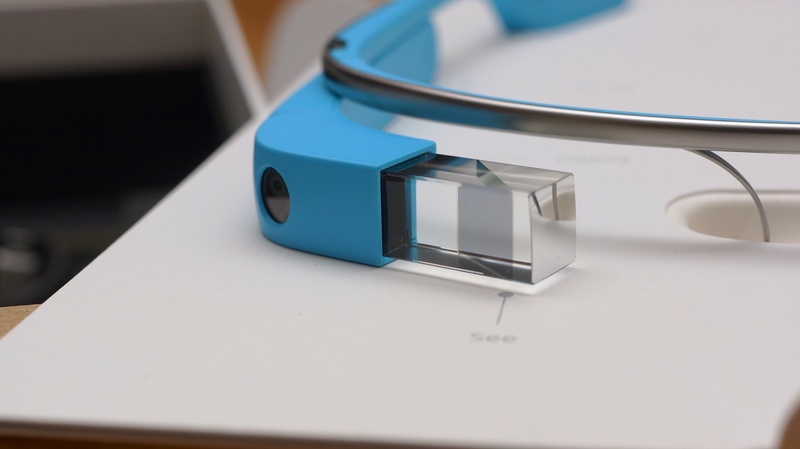 As the body of research on video-based, and especially, wearables-enhanced feedback remains limited, I would like to hear from scholars and practitioners who have/are working with Glass or other wearable devices to share your experiences, opinions, ideas, or comments with me. I would appreciate all the feedback (video or not) I can get! Have something to share? Add to the comments below! Really cool stuff, Jason. Your posts just left me with a few questions. I’m curious about the results of this kind of peer review: What’s the level of engagement for students using this technology for peer review as opposed to the traditional, one-on-one peer review? How do the grades compare and what lessons do the students take with them in other writing contexts? Looking forward to seeing the article you’re writing.